If you get to this form from Accufit, the first thing that you will need to do is to enter the rear wheel clearance and select the top tube slope if it is not to be horizontal. If you wish to produce designs without the aid of Accufit by pushing the designer button on the Rider Data form, this form will be blank and you will need to enter all data. When you enter the top tube height, the Design Units control will be set automatically to match the number you have entered. Do not change this control if the data came from Accufit. A form containing design notes similar to the Rider Notes form is available for additional information pertaining to this design. 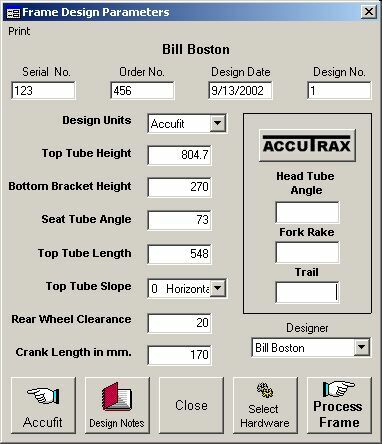 Before processing the frame design, you will need to use AccuTrax to set the steering geometry.